Dozens of residents expressed their views on minimum lot sizes at Randwick community forum. A Randwick City Council community forum has been told that current zoning laws are “archaic” and should be changed as they are causing unnecessary distress. Angry residents said they were worried about impact on property values and problems selling their homes. There was standing room only as 73 registered speakers expressed their views in two-minute slots. 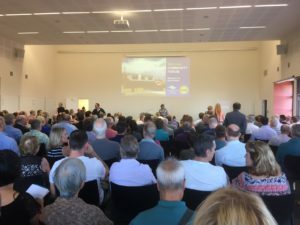 The meeting to discuss potential changes to the minimum lot size in low residential zones under the Randwick Local Environment Plan 2012 was held last week at the Little Bay Community Centre. There are 688 dual occupancies in the R2 zone with 137 of these under company title rather than the more commonly used Strata or Torrens title. The minimum lot size for properties is 400sqm. For a block to be subdivided into Torrens or Strata title it must be at least 800sqm – a potential subdivision is a minimum 400sqm. A council fact sheet outlined potential impacts of changing the lot size rule such as an increase in housing prices and changing streetscape. However most speakers said their concerns were about the titles their homes were held under. One speaker said there were problems trying to sell when you own a share in a property with a neighbour, as is the case under company title. Mayor of Randwick Lindsay Shurey said big banks tightened or in some cases stopped lending for company title properties. “We have recently been approached by a number of people raising concerns about financial hardship caused by banks tightening their lending practices on company title dual occupancies,” Cr Shurey said in a media release. The council had warned that more duplexes changed the nature of the suburbs, including removal of trees and parking. Others opposed high-rise developments. One speaker said: “We would all prefer to have fewer high rises. Just today I read Harry Triguboff wants to put 12-storey blocks in Little Bay. Wouldn’t it be better to subdivide properties and allow people to live in duplexes giving them a backyard, not confining our kids to balconies”? Local real estate agent Simon Nolan said impacts on prices were unlikely. “Allowing subdivision will not impact price as they (duplexes) are already able to be sold separately,” he said. State MP Michael Daley (Labor, Maroubra) said after the meeting he would take a group of council staff and residents to see the NSW Planning Minister, Anthony Roberts, to discuss the issue. Also at the meeting was federal MP Matthew Thistlethwaite (Labor, Kingsford Smith). The community forum is the first step in amending the local environment plan. The process is likely to take 12 months and is subject to final approval by the minister.